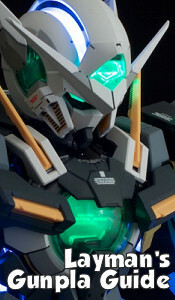 Hello and welcome to the Layman's Gunpla Guide! A bit about myself. I, like many Americans, came to know Gundam through Gundam Wing when it aired on Cartoon Network during the 90's. From there, unlike many Americans, found my way to the other series in the franchise and have been a fan ever since. I'm not quite sure when I started with Gunpla but it followed shortly after. Many of my early kits were built by physically twisting and ripping pieces from the runners (shudder) before I progressed toward cutting and sanding. Interest in the hobby faded away through college but returned not long after. Getting into it and learning more than I had ever known about putting together models and Gunpla I thought it would be beneficial to put together a guide built from lessons learned. 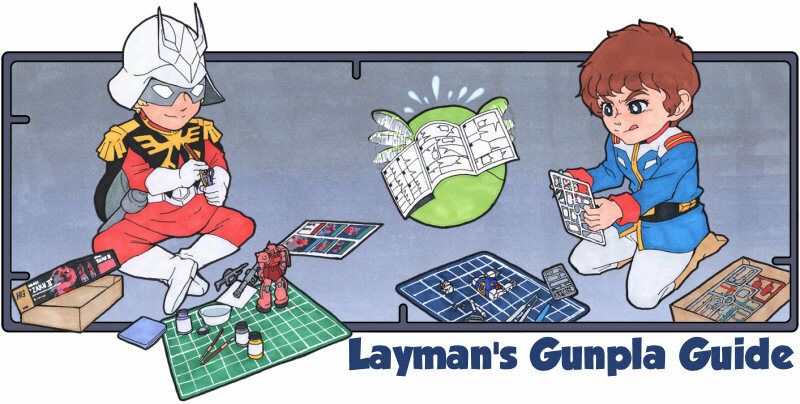 Thus, the Layman's Gunpla Guide was born. The Guide has gone through many changes over the years. As I've grown as a modeler so has the guide. I've done what I can to keep the guide as user friendly as possible and open to builders of all skill sets. It is my wish that this guide provide helpful information to those just beginning and those looking to try something new. Though putting together a Gundam model may seem overwhelming at first, it is really quite easy. It just takes time and patience. The same goes for many of the tutorials. Remember that building Gunpla is about having a good time. Whether you're doing a build straight from the box or going all out with modifications makes sure to enjoy yourself. Beyond this guide there are communities of modelers all around the world willing to share helpful information and partake in the hobby with you. Don't be afraid to reach out! I tried to break down the Guide into basic categories. They're listed below, as well as at the top of every page. Enjoy! Buying Kits & Difficulty Grades - Pretty much everything a beginner needs to know regarding the various kit grades and where one can go to acquire them. Construction Guide - Great for first timers, all the information you need to build your Gunpla up right out of the box. Sampling Paints - Before painting it's best to sample yoru paint and process to make sure everything goes as planned. Here's how I do it. Sig Super Stripe - Want to add stripes to your kit? Don't feel like masking and painting? Check out this specialty product. Mini Thrusters - Add some quick and easy details to your kit by adding mini thrusters with IC sockets. Misc Tricks & Tips - Little tricks & tips that make my life easier. Including using Super Glue to tighten joints and putty to mask thrusters. Recommended Sites - There are a lot of a great sites out there for news, reviews, and other great build guides. Here are the ones I highly recommend.